Here is something completely different and very original. Textile artist Ruth Scheuing is a dedicated cyclist who has found a way to turn the rides she records with her GPS Bike Computer into art! Some of it becomes unique calendar artwork. Ruth says that she now uses her bike a lot more to get around, shop and explore, and this artwork reflects her bike trips in and around Vancouver and some of the many different ways to navigate and experience Vancouver on a bike. Here are Ruth and her partner Trace – with their bikes of course! Here’s some GPS Bike Computer art that Ruth created from a recording of a ride via the Stanley Park Seawall Bike Trail to West Van. Great ride, and what a great way to remember it! 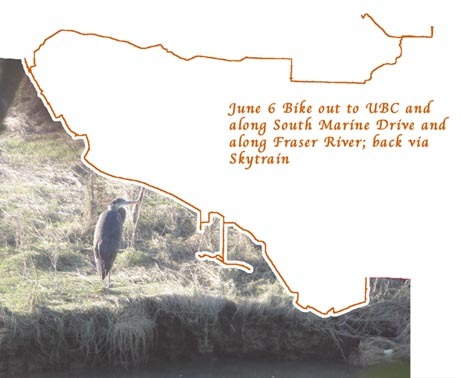 Ruth also makes more abstract GPS Bike Computer art, such as this illustration of a ride out to UBC, along South Marine Drive and the Fraser River, and back to Vancouver via the Skytrain. Ruth says about her GPS Bike Computer art: “Over the last 8 years I have been using GPS (Global Positioning System) to track all of my local trips which I then notate as drawings and personal narratives. Patterns emerge via the abstract lines that represent my everyday activities. Where my GPS drawings deal with personal and localized narratives, my woven Google Earth images provide a more global and historic context. Finding inspiration in both science and art, I try to confuse the boundaries of these apparently distinct fields. The resulting art work includes prints, embroideries, digital Jacquard weavings, and a web project.” (Quoted in The Capilano Review). Here’s another great piece of GPS Bike Computer ar art – this time depicting a bike trip from the West End, over Lion’s Gate Bridge, to West and North Vancouver along the waterfront, and via Lonsdale Quay and Iron Workers’ Memorial Bridge back to Vancouver. Geography as art! 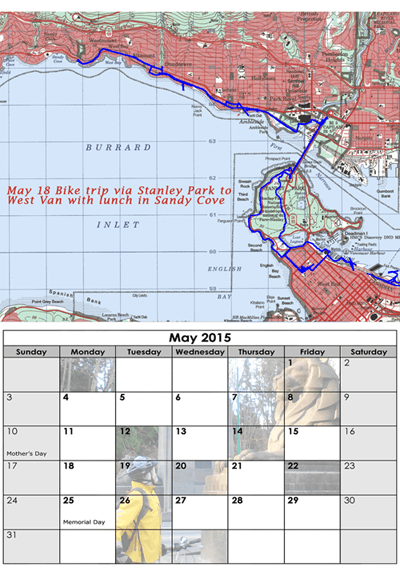 The abstract representation below is also part of a calendar comprising GPS bike computer art! 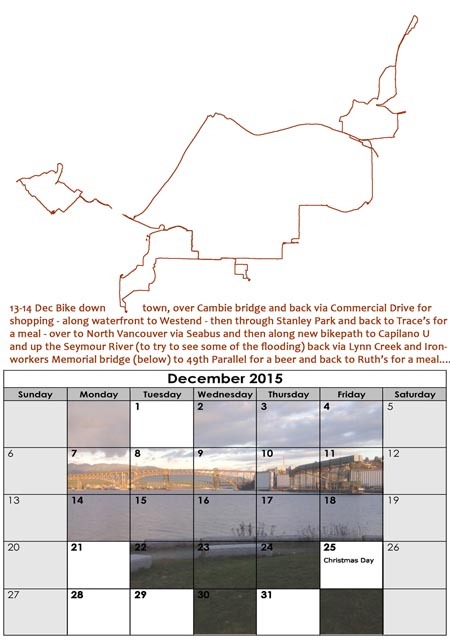 It shows a circular route around Vancouver, over the Cambie Bridge, along Commercial Drive (a great place to stop and shop), then along the waterfront to the West End; through Stanley Park; over to North Vancouver; along the new bike path to Capilano U, up the Seymour River; back via Lynn Creek and the Ironworkers’ Memorial bridge (shown in the photo). 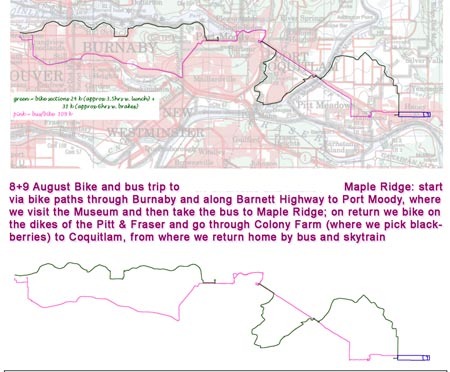 Finally, this GPS Bike Computer art shows a bike and bus trip to Maple Ridge, including a ride on the Barnet Highway (a great place to ride for the intrepid and fit – read my review of the Barnet Highway bike route here). They also biked through Colony Farm and stopped to pick blackberries – this would have been on the magnificient Traboulay Poco Trail in Port Coquitlam. 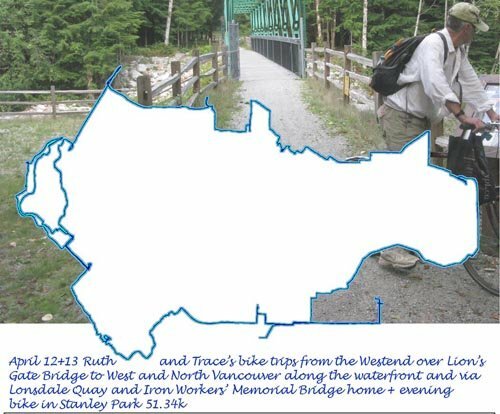 If you want to recreate Ruth’s experience, you can read all about the magnificent Poco Trail here. 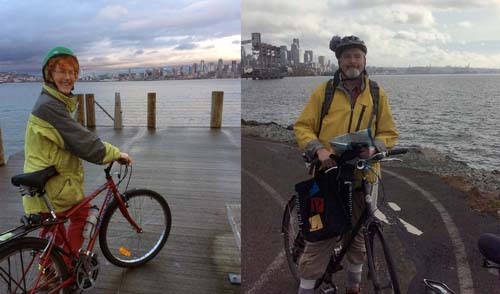 And coming up next in a post next week – Ruth and Trace’s bike trip around Portland. They went south on the Willamette River to Selwood Bridge, then north via the hills on Terwilliger Road, then on to the Green Dragon Brew Pub! To make sure you don’t miss it, subscribe to my blog by clicking on the link below (right next to the photo of Mrs. Average Joe Cyclist, aka Maggie). For more great bike trails, click here.